This Frigidaire electric range is very well rounded as it has all the baking functions you’ll want or need with a very reasonable price tag. The biggest thing to know about this one is that it has no convection features. That really helps bring the price down. The oven size is nothing exceptional at 4.8 cu. ft., and only has space for 2 racks. You can delay baking and delay self-cleaning for your convenience, and the easy touch controls and digital display make the range very user-friendly. We were impressed with the overall design and the heating, baking, and broiling performance. 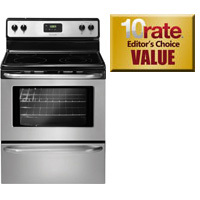 This Frigidaire electric range can be found for $549 to $649.